With its huge soundbank, four oscillators, Wave Editor and MIDI Player, Ascension is a powerful dance music workstation. Four oscillators drawing on a massive library of waves and samples. Draw and import your own waveforms. Built-in MIDI player and 1700+ MIDI files. 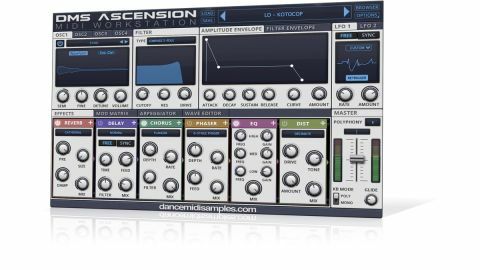 Soundware label Dance MIDI Samples’ first foray into virtual instrument development, DMS Ascension (VST/AU/standalone) is a combination synth/ROMpler, aimed at dance and electronic producers, and boasting around 10.5GB of content. The actual numbers within that are impressive: 870+ presets, 1100+ single- cycle waveforms, 900+ multisamples, and 1700+ MIDI patterns taken from across the company’s enormous catalogue. Ascension’s browser switches between presets, waveforms/samples and MIDI clips, depending on where it’s invoked. It’s got basic search and tagging, but it really needs big headers or colour changes between content types, as it always looks the same, which can get disorientating. Presets are quite slow to load, too. Ascension is a four-oscillator instrument, with each oscillator hosting one of the aforementioned subtractive or ‘digital’ waveforms, or multisamples. While you can’t directly load your own samples, you can import them for conversion to editable waveforms (see Making waves). Up to 12 unison voices with spread and detune are on tap per oscillator, but all of the unison controls apart from Detune are buried away in the Settings panel of the Options menu – a workflow carcrash if ever we saw one. Each oscillator also has its own high and low shelving filters, FM via one of five waveforms with four pitching modes, and adjustment of phase and panning. Selecting the Custom option in an oscillator or LFO wave selection menu opens DMS Ascension’s Wave Editor tab, where you can design your own single-cycle wave shapes from scratch, a preset starting point, or a (very short) imported WAV. The waveform appears in the main display, where it can be freely shaped using a palette of graphical tools. The Draw and Draw Line tools facilitate freehand drawing and the creation of straight lines, while the Blur Samples tool seemingly randomises the point values within the area to which it’s applied, making the waveform ‘softer’. The Vertical and Horizontal Drag tools work to an eight- section grid, shifting the waveform up/down or left/right in the selected section only. Right-clicking calls up a menu of subdivided waveforms, filling that grid section with 1-4 short sine, triangle, square or saw shapes. It’s a clever setup for creative tweaking, but the option to alter/disable the grid needs adding. The resonant filter offers LP, HP and BP types in 2-pole, 4-pole and state variable modes, and overdrive. It sounds fine but exhibits a lot of audible stepping when swept manually - thankfully not when modulated. Modulation sources comprise two syncable LFOs and six envelopes. The LFOs can run custom waveforms, just like the oscillators, and the ADSR envelopes feature curve-adjustable Attack, Decay and Release stages. Assigning them to targets (including all effects parameters) is done in a simple mod matrix. Six decent-sounding effects are onboard: Distortion, Chorus, Phaser, EQ, Delay and Reverb, each with its own dedicated control panel, and all freely reorderable. The Arpeggiator provides up to 32 steps of arpeggiation and sequencing, with all the usual modes and parameters. It also doubles up as a handy MIDI file player, loading MIDI loops in from the browser for triggering with sustained note input. While you can’t edit the clips within the Player, you can drag them out to your DAW for editing (but not back again). DMS Ascension is an extremely well-stocked source of all kinds of well-produced dance music orientated sounds - basses, leads, plucks, pads, orchestrals, pianos, guitars, FX - with a fully realised synth architecture for cooking up your own patches. The hybrid oscillators are supremely versatile, the interface is easy to understand, and the Wave Editor and MIDI Player features are both very useful. On the downside, it’s a shame you can’t drag MIDI files into Ascension from a host DAW, the hidden unison settings are a definite fail, and we hope preset loading times improve in future versions. Overall, though, there’s a lot to like here, at a reasonable price.